LED or Flash? Which is right for you? If you shoot on location, you know that the size and weight of the gear is important. Shooting in bakeries, restaurants, and kitchens will provide you with a wide range of room size and lighting conditions. There may not be beautiful window light, outlets, or a large area that you are able to shoot in. To be prepared for any shooting environment in the culinary world you need a light-weight, compact, and battery-powered lighting system. In designing this system, you have two choices: LED or Flash. 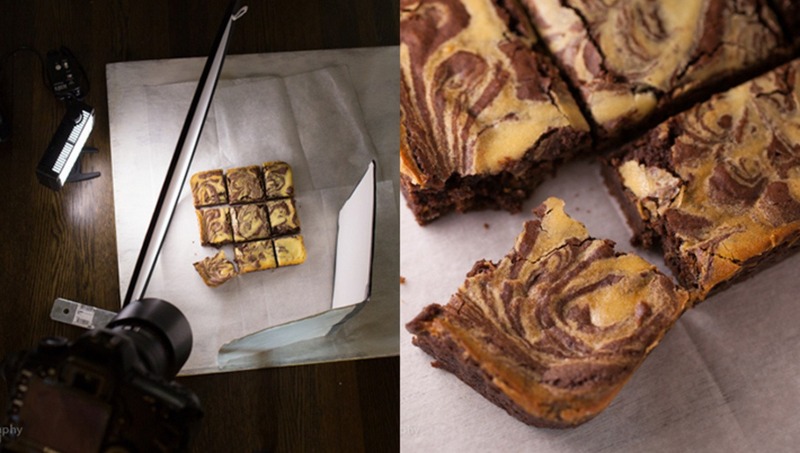 In the following examples, I shot a group of brownies on top of a 2'x2' painted wooden background. I used a collapsible diffuser clamped to a metal bracket as my light modifier. For fill, I used a foam board V reflector. This set-up is small, light weight, and can be used with many different light sources. 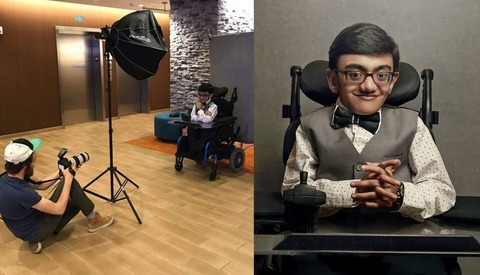 Both shots used the same lighting set-up. The only difference was the light source. Let's take a look at the images taken with a Canon 580 EX II. These images were shot with a Litepanels Micro Pro On Camera LED Light. LED panels come in a variety of different sizes. This panel is designed to fit on your camera's hot shoe mount, so it is small enough to easily fit into your camera bag. The following photo was taken at ISO 1000, f/3.5, and 1/100 sec. If you need an LED with more power, you can use a larger panel. 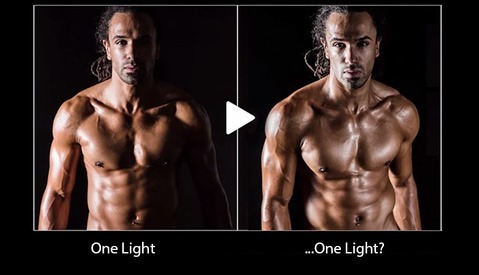 The above pictures show that both light sources can light a set and create a beautiful image! But what if you wanted to be able to include video of your subject? Here is a short video showing the results of what happens when video is introduced. When shooting video, a flash won't work. The short duration of the flash will just show up as a white blip. For a video as beautiful as your still images, you will need a continuous light source, like an LED source. If your assignment calls for video and stills, an LED light source will work well! You can use florescent lighting, but if the size of your gear is a concern, LED panels are the better choice. So, what is best for you? That is something that you will have to decide for yourself. Do you shoot stills and video when on assignment? What light sources have worked well for you? As LEDs become more powerful and less expensive do you see yourself using them in your work? 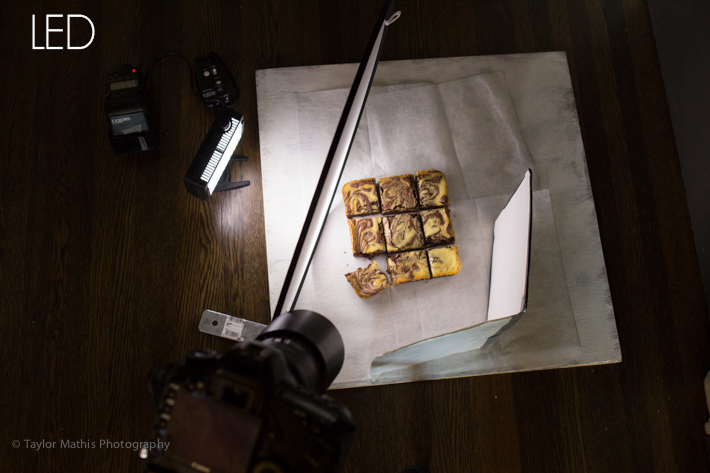 Interested in learning more about food photography styling and lighting techniques? 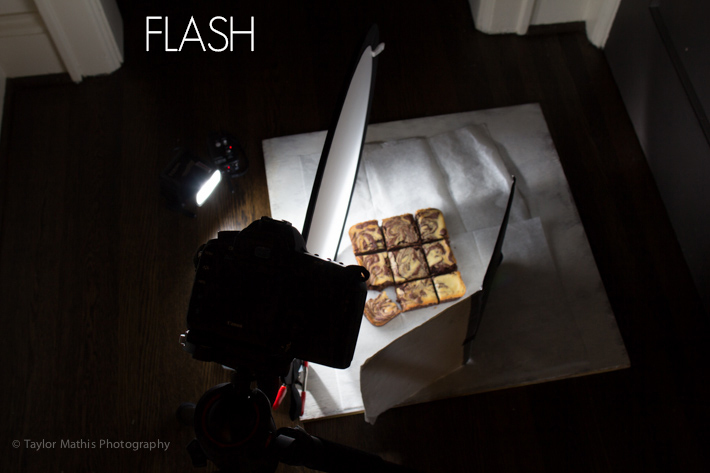 Check out Issues 1-6 of photographing FOOD. i'd go with the cheaper, (over brand named flash's) priced yongnuo flashes, and save a bunch of money. But, I also use geico, so i am THAT kind of a guy. LED seems to have better shadows, Flash seems to have better Highlights. Screw the flashes....where do I get those brownies? What's the color rendering index (CRI) on these LED units? Something tells me flash holds the upper hand in CRI. Plus you can shoot at lower ISO vs. constant light. Yea, this could all edited in post but the flash seems to have a more accurate tone/contrast vs the LED which almost looks dull or washed out. Outside studio environment, LEDs are too weak for my purposes. if the LED light is as powerful as the flash, then yeah. Im sold. But shooting with LED at 1000 ISO compared to shooting with Flash at say ISO 100 or 200. Surely a lot of grain is starting to be introduced there? 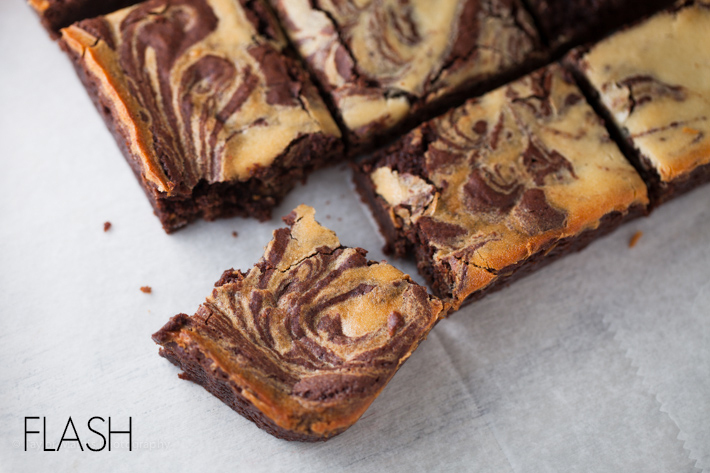 for still products you can drag your shutter, there was no need for the brownies to be shot at iso 1000. You also usually have much better control with light shapers with strobe just because the technology has been around for so long (which means you also have access to tons of DIY alternatives and cheap second hand gear... strobist anyone? ).